In collaboration with the Polish Kyokushin Tezuka Group. Special invitation for all members of the European Kyokushin Tezuka Group. This morning we had the monthly black belt training. Shihan Gaddum sadly couldn’t be there, but the die hards were trained in Garyu by Sensei Vincent Poncelet. 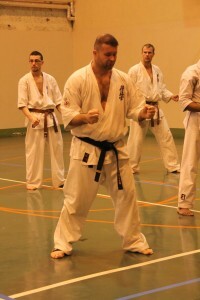 We trained some kumite-no-kata’s as well, even Kumite no Kata To Uke (with the help of Sensei Sander). We missed a lot of Tezuka members, but were very pleasantly surprised by the visit of Sensei Philip! Always glad to see you, Sensei! Next time bring your gi! For all the other Black belts (ichi kyu and ni kyu as well) the next training will be next year, probably january 11th. I will bring the champagne so be there!! !